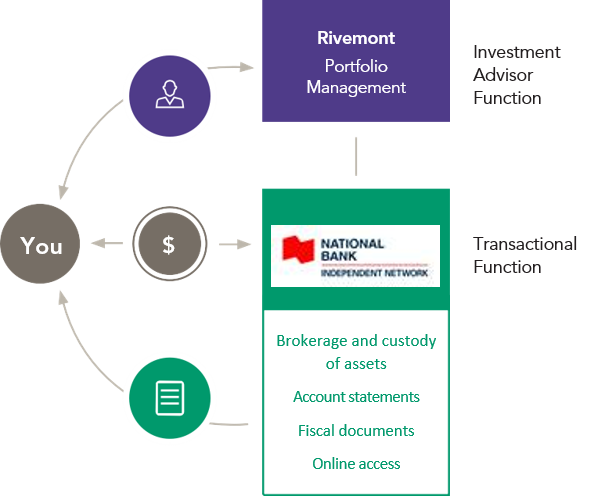 The client portfolios are managed by Rivemont but held in accounts at National Bank of Canada, more specifically with a divison called the National Bank Independent Network (NBIN). NBIN is a financial institution that administers assets of more than $400 billion and is a member of the Canadian Investor Protection Fund. That fund protects your assets to a maximum $1,000,000 (and more in certain cases) in the very unlikely possibility of an insolvency of the financial institution. By virtue of its mandate, Rivemont transmit instructions to NBIN to buy and sell securities within your account, but in no circumstances Rivemont have access to the assets held in your account.